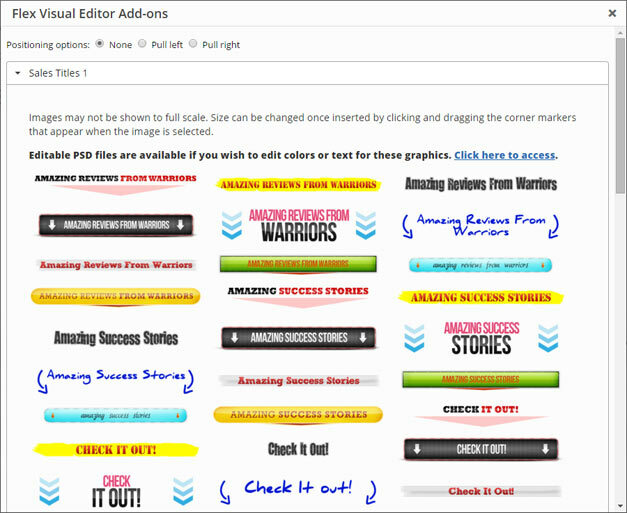 The Sales Page Titles plugin adds 100 selectable images to the ‘Add Ons’ button in the visual editor when using FlexSqueeze 2. It contains 10 common phrases in 10 graphical styles that are insertable anywhere in your page content. In the popup that appears after clicking the ‘Add Ons’ button, you will then have a new collapsible section titled ‘Sales Titles 1’ that you can expand to show the images. Simply click on any image to insert it into your content at the cursor position. Once an image has been inserted, you can easily resize it by dragging any corner of the image or center it using the ‘Align center’ button on the visual editor toolbar. If you wish to create similar titles using different colors or text, PSD files (Adobe Photoshop) are available for all styles as a separate download. The PSD zip includes 5 bonus styles that are not included in the plugin.